WBUR-FM (90.9 FM) is a public radio station located in Boston, Massachusetts, owned by Boston University. WBUR is the largest of three NPR member stations in Boston, along with WGBH and WUMB-FM. WBUR produces several nationally distributed programs, including Car Talk, On Point, Only a Game, Here and Now and Open Source, and previously produced The Connection (which was canceled on August 5, 2005). RadioBoston, launched in 2007, is WBUR's only purely local show. WBUR's positioning statement is "Boston's NPR News Station". WBUR also carries its programming on two other stations serving Cape Cod and the Islands: WBUH (89.1 FM) in Brewster, and WBUA (92.7 FM) in Tisbury. The latter station, located on Martha's Vineyard, uses the frequency formerly occupied by WMVY. In 1998, WBUR helped launch WRNI in Providence, Rhode Island—the first NPR station within Rhode Island's borders. It has since sold the station to a local group. According to Ken Mills, a Minneapolis broadcast consultant and Nielsen data, the number of listeners of WBUR has grown since 2012, increasing from 409,000 to 534,400. WBUR is the sixth-most popular NPR news station in the United States. 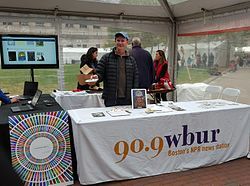 The WBUR-FM information booth at the 2015 Boston Book Festival. WBUR programs On Point, Only A Game and Here and Now are carried nationwide in the US on hundreds of public radio stations and on XM Radio's public radio station, XM Public Radio. In total, WBUR produces more than 25 hours of news and programming each week. On Point is a two-hour discussion show formerly hosted by Tom Ashbrook, broadcast weekdays, with two hourly segments devoted to separate topics. Often one hour-long block will focus on a political issue and the other will focus on arts and culture. On Point began as 'special programming' in the aftermath of the 9/11 attacks, originally airing from 7 to 9 p.m. It took over the time slot of the similar The Connection when that show was canceled in 2005. Here and Now is a news and culture digest show hosted by Jeremy Hobson and Robin Young, normally consisting of several interview segments with reporters, authors, artists and statesmen. It began as a regional and local show, but soon expanded to cover national and international issues. The show is syndicated nationally by more than 400 other NPR member stations. Open Source is a weekly show hosted by Christopher Lydon, former New York Times journalist and original host of The Connection. The show focuses on the arts, literature, and foreign affairs. In 2007, WBUR launched Radio Boston, a weekly radio show featuring longtime Boston journalist David Boeri. The show was later hosted by Jane Clayson Johnson as a one-hour discussion and interview, though Boeri still introduced each show with a report from the field. In 2010, Radio Boston expanded to broadcast Monday through Friday. In the fall of 2010, new host Meghna Chakrabarti went on maternity leave and was temporarily replaced by WBUR reporter Sacha Pfeiffer. Chakrabarti has returned, and is currently co-hosting the show with Anthony Brooks. Only A Game is a weekly sports program broadcast twice on Saturdays. The show was formerly hosted by Bill Littlefield and is syndicated to about 210 affiliate stations by National Public Radio. The wide-ranging program describes itself as "irreverent" and often covers sports from a human interest angle, rather than appealing directly to a particular fan base. On Sunday evenings, WBUR-FM also broadcasts a show entitled Boston University's World of Ideas. The show features academics and intellectuals presenting lectures and answering questions on issues of national or global importance. The 3-minute comedy sketch series 11 Central Ave, broadcast on WBEZ in Chicago, was for a time recorded at WBUR. WBUR began producing podcasts in 2014. Current productions include Dear Sugar Radio, an advice podcast with Cheryl Strayed and Steve Almond; and Modern Love, a partnership with The New York Times. WBUR first went on the air March 1, 1950 with studios and transmitter located on Exeter Street in Boston. Initially, most of WBUR's staff were Boston University students, with the station broadcasting primarily classical, jazz and BU sporting events. In the early 1960s, the station moved from Exeter Street to the newly renovated School of Communications building on Commonwealth Avenue. By the 1970s, WBUR began receiving funding from the Corporation For Public Broadcasting and became a "public radio station" with a professional staff. BU students continued programming on a low-power AM transmitter serving the BU campus. The WBUR studios remain on the BU campus on Commonwealth Avenue in Boston. During the 1970s and 1980s, the station had several jazz music and classical music programs. The disc jockeys demonstrated a broad knowledge of composers, performers, and the execution of jazz, demonstrating familiarity with such matters as improvisation and shared this with listeners.' Noteworthy jazz and classical disc jockeys included Dennis Boyer (classical: FM in the PM), Steve Elman (jazz: Spaces), Tony Cennamo (jazz: New Morning and subsequently, a night-time show), James Isaacs (jazz), and Jose Masso (Latin: Con Salsa). One exception to this was the expansion of overnight programming, most notably the 2-to-6 Shift hosted By Kevin Vandenbroek and Bob King. It lasted about 9 months when it was cancelled by the Station Manager Bonnie Cronin. This act lead to the Director of Programming Victor S. Wheatman to resign. At the end of the 1980s, WBUR began replacing many of its music programs with news and information programming from NPR, Public Radio International and the BBC. This brought WBUR into head-on competition with another major Boston-area NPR station, WGBH. WGBH eventually decided to retain a mostly music (classical music daytime/jazz nights) and cultural programming format (WBUR's former territory), although WGBH did broadcast NPR's Morning Edition and All Things Considered. By the early 1990s, with the exception of Con Salsa on Saturday nights, WBUR had adopted an around-the-clock news and information format. Numerous NPR member stations have since followed WBUR's lead and eliminated music programming in favor of news and information programming (including rival WGBH, which transferred classical music programming to WCRB following its acquisition in 2009, though it continued to program jazz at night until July 2012; since then, WGBH has only aired a few hours of jazz on weekends). By 2009, the majority of NPR member stations were programming 24/7 news and information formats. WBUR's main signal operates at only 8,600 watts, which on paper is somewhat modest for a full NPR member on the FM band. However, due to its transmitter's height (1,174 feet) it decently covers much of eastern Massachusetts, though it does not penetrate nearly as far to the south and north as WGBH-FM penetrates. During the 1990s, WBUR began expanding onto Cape Cod. In 1992, it partnered with Cape Cod Regional Technical High School to air WBUR programming over its WCCT-FM when students were not on the air. The following year, WBUR reached similar arrangements with WSDH (91.5 FM) at Sandwich High School and WKKL (90.7 FM) at Cape Cod Community College. In 1997, auto dealer Ernie Boch, Sr. donated WUOK (1240 AM) in West Yarmouth, which had been simulcasting WXTK, to Boston University, which changed its call letters to WBUR and made it a full-time satellite of WBUR-FM (which added the "-FM" suffix to accommodate the West Yarmouth station as A.M. stations always have the base callsign). WBUR programming was then dropped from WKKL in 1999, as the 1240 AM signal can be heard in much of WKKL's coverage area. On November 27, 2012, WBUR announced that it would acquire WMVY (92.7 FM) in Tisbury (on Martha's Vineyard) to serve as an additional satellite, under the call letters of WBUA. The transaction was completed on February 8, 2013; at midnight that night, WBUA began to carry the WBUR schedule. WMVY's adult album alternative programming continued through an online stream and eventually they acquired a new FM facility on 88.7 and expanded it into the current incarnation of WMVY. The acquisition of WBUA rendered the 1240 AM facility redundant; on August 5, 2013, BU announced that it would be sold to Alex Langer, who would program it with Portuguese-language programming similar to that of another Langer station, WSRO. The call letters of 1240 AM were changed to WBAS on February 1, 2014, two days after BU and Langer agreed to a time brokerage agreement. Soon afterward, WSDH also dropped WBUR's programming. WBUR added another Cape Cod satellite on May 23, 2014 with the sign-on of WBUH in Brewster; this station broadcasts at a higher power than other noncommercial stations on Cape Cod, allowing it to serve the majority of the region (the exception is the Falmouth area, which is within WBUA's coverage area). BU had sought to build a station on Cape Cod since 2004 and applied for the 89.1 facility in Brewster in 2007, but in March 2011 the Federal Communications Commission issued the construction permit to Home Improvement Ministries, who subsequently sold the permit to BU. In 1998, WBUR helped to found Rhode Island's NPR station WRNI. At the time Rhode Island was one of two states lacking an NPR station. WBUR decided to partner with the newly formed Foundation for Ocean State Public Radio to build a state-of-the-art facility at historic Union Station in downtown Providence. Initially, WBUR invested heavily in WRNI's local programming, but several of these programs were soon canceled, and its schedule became almost identical to that of WBUR. In 2004, WBUR announced suddenly that it planned to drop WRNI by selling it, raising a number of questions. Rhode Islanders were angry at the thought that they would be forced to buy a station they had invested greatly in creating. It was later revealed that the WBUR management believed WRNI was a financial drain and wished to get rid of it. The resulting management turmoil caused the departure of longtime WBUR station manager Jane Christo. Eventually, the Foundation for Ocean State Public Radio, renamed Rhode Island Public Radio, bought the station in 2008, it has since rebranded as The Public's Radio. Between 2001 and June 2002, WBUR estimated that it lost between $1–2 million due to the loss of at least six underwriters and a number of small donors. This was the result of a boycott launched by Jewish groups who charged that NPR coverage of the Middle East was biased against Israel. Boston is a major center for the American Jewish community and this made Israel a particularly sensitive subject. The boycott started in October 2001, when two Boston-area businesses ended contracts: WordsWorth Books (now defunct) in Cambridge, Massachusetts, and Cognex Corp. in nearby Natick, Massachusetts. The two businesses were reportedly tied with the advocacy group Committee for Accuracy in Middle East Reporting in America (CAMERA), a persistent critic of NPR's coverage for almost a decade. CAMERA has demonstrated outside National Public Radio (NPR) stations in 33 cities in the United States. The CAMERA boycott also extended to The New York Times and The Washington Post. Fairness and Accuracy in Reporting and explicitly pro-Palestinian organizations have made contradictory accusations of pro-Israel bias in NPR's coverage or imbalance in particular stories. NPR's ombudsman and an independent reviewer appointed by the agency found "lack of completeness but strong factual accuracy and no systematic bias" in reporting on the controversial issue. WBUR (1997–2014) Langer Broadcasting Group, owner of WSRO. Transitioned to Portuguese language programming in December, 2014. ^ a b c d "The Boston Radio Dial: WBUR-FM". The Archives @ BostonRadio.org. Retrieved January 15, 2012. ^ "Performance of Public Radio News Stations" (PDF). Retrieved December 30, 2015. ^ a b c Lantz, Brian (May 23, 2014). "WBUR debuts on new Cape frequency". Cape Cod Times. Retrieved May 23, 2014. ^ Wells, Julia. "Radio Station WMVY Will be Sold to WBUR". Vineyard Gazette. Retrieved 27 November 2012. ^ a b "Call Sign Changes" (PDF). Federal Communications Commission. Retrieved December 15, 2012. ^ Arsenault, Mark (2017-06-04). "In well-mannered public radio, an airwaves war". The Boston Globe. Retrieved 2017-06-04. ^ "11 Central Ave :: Bios". www.11centralave.org. ^ Johnston, Maura. "'Dear Sugar' ushers in a new era of podcasts at WBUR - The Boston Globe". BostonGlobe.com. ^ Scott Fybush. "New England RadioWatch: January 18, 1997". The Archives @ BostonRadio.org. Retrieved January 15, 2012. ^ Myrick, Steve (November 27, 2012). "WMVY sold to Boston station WBUR, will cease local programming". The Martha's Vineyard Times. Retrieved November 27, 2012. ^ a b "WBUR will begin broadcasting on 92.7 FM at midnight Friday". The Martha's Vineyard Times. February 6, 2013. Retrieved February 9, 2013. ^ Venta, Lance (August 5, 2013). "Boston University Sells Cape Cod Signal". RadioInsight. Retrieved August 6, 2013. ^ Reidy, Chris (August 5, 2013). "Langer Broadcasting to buy 1240 AM signal in West Yarmouth from WBUR". The Boston Globe. Retrieved August 6, 2013. ^ "Call Sign History (WBAS)". CDBS Public Access. Federal Communications Commission. Retrieved February 3, 2014. ^ "Time Brokerage Agreement" (PDF). WBAS sale application. Federal Communications Commission. January 30, 2014. Retrieved February 3, 2014. ^ "NPR's pro-Israel critics punish WBUR". 2002-06-03. Retrieved 2015-07-25. ^ Sharon Samber (2002-06-14). "NPR reacts to charges of anti-Israel bias in coverage". Jewish Telegraphic Agency. ^ Glenn Frankel (July 16, 2006). "A Beautiful Friendship?". Washington Post. Retrieved May 7, 2012. ^ "NPR's pro-Israel critics punish WBUR". Current.org. June 3, 2006. Retrieved May 6, 2012. ^ "Fairness In Covering Israel And The Palestinians: The End Of An Accounting". NPR.org. ^ Broadcasting & Cable Yearbook 1999 (PDF). 1999. pp. D-213–4. Retrieved February 9, 2013. ^ Halper, Donna; Wollman, Garrett. "The Eastern Massachusetts Radio Timeline: the 1940s". The Archives @ BostonRadio.org. Retrieved January 15, 2012. ^ "AM Query Results". Retrieved 2015-07-18. Link to Radio TNT Boston, which broadcasts on WBUR-FM's 67kHz subcarrier. Retrieved June 27, 2016. 1 = Part 15 station with notability. 2 = Clear-channel stations with extended nighttime coverage. 3 = Under a "Shared Time" agreement.